What makes us who we are in the eyes of others? Is it our outer appearance, our inner turmoil or the objects and actions we surround ourselves with? Portrait artists have been exploring these concepts for centuries, as a new exhibition at the Victoria Art Gallery in Bath reveals. 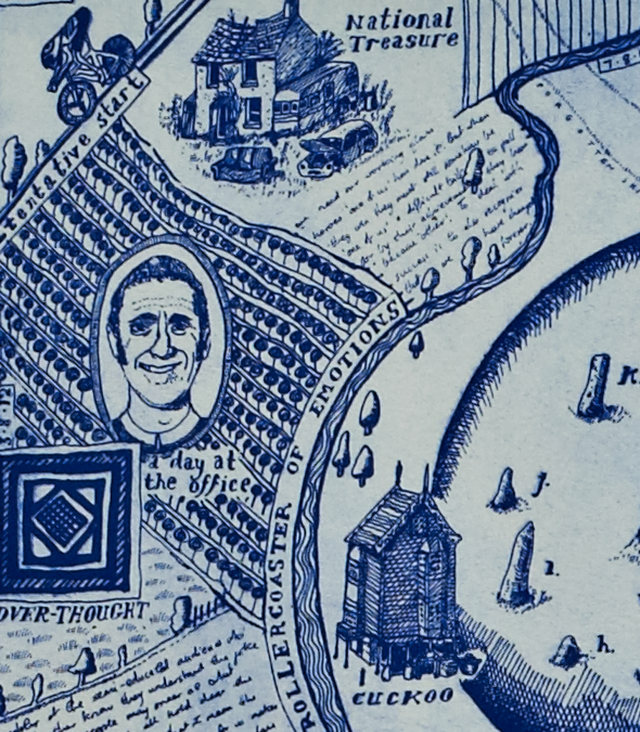 The free exhibition Portraits and Identity has been curated around Grayson Perry’s Map of Days etching, which was acquired last year for the Gallery’s permanent collection. “The piece is an unusual self-portrait in the form of a walled city, the streets and buildings inside the wall representing aspects of the artist’s personality, whilst outside the walls are the things that did not penetrate the defences,” explains Jon Benington from the Gallery. The river of imagination flows past a walled city made up of streets with names such as ‘Intuition’, ‘Revenge’ and ‘Churning Insecurity’. Other portraits in the exhibition include works by artists as diverse as Hogarth, Dürer and William Nicholson. It’s an intriguing insight into the ways artists used visual props, such as books or the tools as their trade, to impart us details of a sitter’s life. 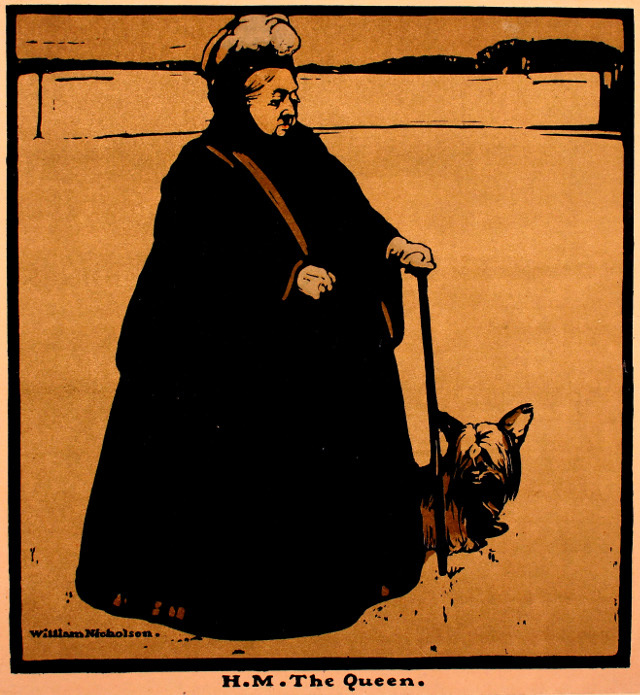 Other examples offer more subtle clues, such as this lithograph of Queen Victoria walking her dog in the gardens of Kensington Palace, and described by the artist as looking like ‘an animated tea-cosy’. It reveals her formidable character alongside her love for her affection, and, through this, for her people. Then there’s the work of caricaturists, which are far more direct, with Gillray transforming naturalist Joseph Banks into a showy butterfly after receiving the Order of the Bath, while William Hibbard depicts the Bath Corporation with symbols of their businesses for heads. 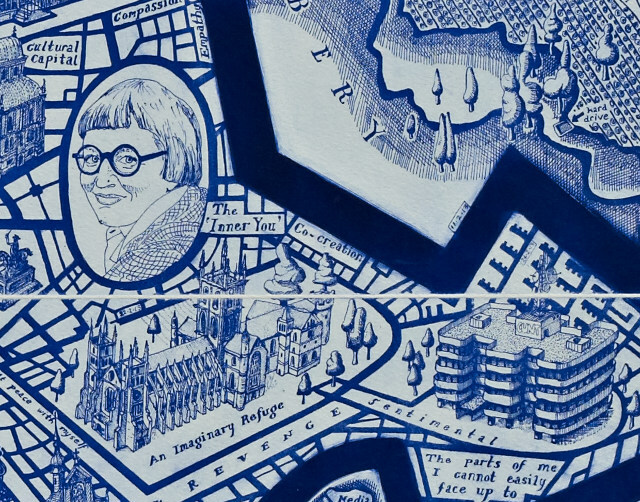 Portrait and Identity is on at the Victoria Art Gallery, Bath, from 20th August until October 4th 2015, and runs alongside the Jane Austen’s Bath exhibition. This entry was posted in Inspiration and tagged art exhibitions, Grayson Perry, Portraits and Identity by Judy. Bookmark the permalink.